You're ready to buy a new HDTV. You know how to use Google, so you're drowning in data but thirsting for information. You've read eight LCD vs. Plasma articles, talked to five big box electronic store employees ranging from knowledgeable to clueless to weird, and you still haven't found the answer to your most basic question: What features should I care about when purchasing this TV. By arming you with just a little bit of tech knowledge to explain “why,” I'll help you make the decision on “what” to buy much easier than you might think. First, let's get some of the techno-babble and common questions out of the way. It doesn't really matter. Gasp! That's right. Despite the innumerable articles written each year on this topic alone, it simply isn't extremely relevant in 2008. When HDTV technology was in its infancy, LCD panels couldn't be produced as large as plasma displays. LCD TVs also suffered from high response times that contributed to blurriness for fast-moving objects. While plasma displays will always be able to produce a blacker black than their LCD counterparts, LCD displays have narrowed the gap in size and picture quality for all but the most discriminating videophile. They also lack the glass covering of plasma displays and will exhibit less glare in a light-rich environment. Practically speaking, just buy whichever technology within your budget looks best to you, because that's what is ultimately important. What is 1080p and why should I care? While I think the technical details of high definition video is an enthralling subject, I understand that not everyone shares my enthusiasm. Therefore, I offer the following quick and dirty synopsis. There are three formats for high-definition television: 720p, 1080i, and 1080p. Because of the way display technologies have evolved, we don't talk much about 1080i, so just ignore it for now. The number (720 / 1080) refers to lines of resolution. More resolution is better, therefore 1080p is better. Look at the picture below. 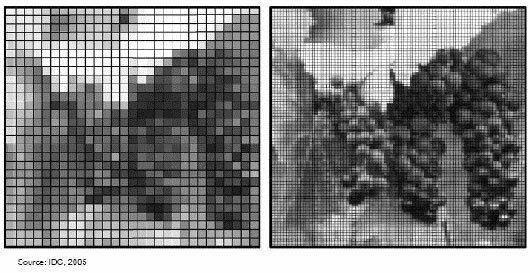 The image to the right has more lines of resolution. Not every TV can display 1080p and not all content is offered in 1080p. You must have both parts of the equation to get a 1080p image. As a matter of fact, the only widespread 1080p content offered anywhere right now is through Blu-ray movies and gaming consoles. If watching movies or high-definition gaming isn't a hobby of yours then you can immediately deduce that you do not need a 1080p HDTV. Furthermore, network and cable HDTV is not offered in 1080p, and because of bandwidth considerations it will not be offered in 1080p for the foreseeable future. 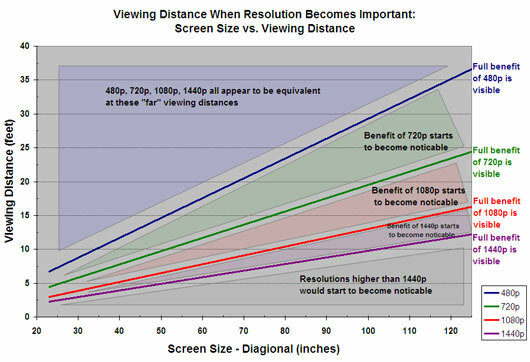 Lastly, there is simply a limit to what the human eye can see, and the difference between 1080p and 720p isn't pronounced at smaller screen sizes and larger viewing distances. Use Carlton Bale's chart below as a rough guide, but not necessary canon. I present the above information not to talk you out of buying 1080p technology, but to show you that depending on your viewing habits you may never benefit from it. If that sounds like you, then you can save a ton of cash by going with a 720p display-and it will still look incredible. You want a flat-panel TV that will make your home look more modern. In this case a quality but budget-priced LCD or plasma will suffice. I recommend Vizio, Westinghouse, Olevia, and Panasonic. Each of these manufacturers produces a good product, even good enough for some discriminating videophiles, but they offer bargain-basement prices. You can often find the best deals from membership clubs like Sam's and Costco. Costco is generally better for electronics. While it's possible to find oddball sets 5-10% cheaper, I suggest going with a proven budget brand. On July 8th Syntax-Brillian, the manufacturer of Olevia HDTVs, filed for chapter 11 bankruptcy. Since the future of the company is uncertain, retail stores may liquidate their existing stock at bargain prices. However, your warranty on that new Olevia may not be worth the paper it's written on. On the other hand, it could also be as good as gold if the company successfully restructures. Caveat emptor. You're a technophile that settles only for the best. Look no further than a Pioneer plasma. Pioneer has long been the king of top-tier plasma displays, and their new Kuro line is no exception. However, the price is simply in a different league than other comparably sized HDTVs. If you've got the money to spend and you demand the best then this is one of the few simple answers in HDTV shopping. Black levels, color reproduction, and finish don't really get much better. Expect to pay at least twice as much as a comparable budget brand. You want the biggest screen size possible for your dollar. Check out projection HDTVs using DLP technology from Samsung and Mitsubishi. DLP stands for “Digital Light Processing.” These HDTVs take an image the size of a postage stamp and project it on a large screen through lamps, mirrors, color wheels, and black magic. Any new DLP HDTV is going to feature 1080p resolution and exhibit great picture quality at a comparatively lower price to even an LCD or plasma that only features 720p resolution. Because of market pressure most companies have concentrated their DLP lines on the 61″ and larger sizes. These screen sizes are still prohibitively expensive with plasma and LCD technologies, making DLP the king of screen real estate for the dollar. However, they are bulkier than flat-panel displays, and are not wall-mountable. You're somewhere in the middle. You want excellent picture quality but you can't bring yourself to buy a television that costs more than your car. You also want a sizeable picture, but your dwelling isn't large enough for a 60+ inch behemoth. I suggest looking at product lines such as the Sony Bravia and Samsung LN series. There are numerous HDTVs in this price band, so be discriminating about which offer a superior picture and which simply offer a higher price. Never trust the store's picture calibration. Retail chains always jack up contrast to make the picture more eye-popping at the expense of accuracy and detail. Research basic picture calibration and insist on playing with the TV's settings before you purchase. Know the answers to the following questions before you shop. What is your intended viewing distance? What size display do you want? Do you want a 1080p display? Do you want a wall-mountable flat-panel display? What video sources will you feed your new HDTV? Know what features you want and understand why you want them. Don't be intimidated by the jargon. For every term you don't understand there is a Wikipedia article to explain it. Use the internet to research your decision meticulously before purchase. Don't buy impulsively. Don't blindly believe salesmen. They often have just enough training to throw around fancy terms while misunderstanding the underlying technology. They are often correct, but independently verify everything they say. Purchase the set within your budget that looks best to your eyes in your home. Finally, relax. If you are upgrading from a standard definition TV then high definition content on any HDTV is going to blow you away, so you are unlikely to make any egregious errors that will haunt you for years. Educate yourself, shop around, and then go with your gut. …Rather than ‘p’ (progressive) which has your device sending the whole image (much more data) to your screen, thus making it look a bit clearer. The alternating ‘i’s fill the “missing” parts of the previous image, whereas the ‘p’s are all together as one image. Does that make sense? The reason it’s important is that if you’re going with a Vizio (I did, and I’d recommend for affordably solid hd) they mostly have up to 1080i which I still think looks great but isn’t the same as 1080p. Another thing to consider is that you’ll have to buy hdmi cables to be able to get hd on your tv which ads extra cost. I had to keep things somewhat brief, and progressive vs interlaced is one of the topics that had to be culled. While your explanation of progressive vs interlaced is correct, 1080i is not a real factor in today’s HDTV market. LCD and Plasma displays have what’s called “native resolution.” There is a physically tangible matrix of pixels on the screen of each LCD/Plasma HDTV. If you count them you’ll either get 1280×720/ 1366×768 (collectively referred to as 720p) or 1920×1080 (1080p). While 720p and 1080p televisions can both display 1080i content, it’s more of a signal conversion issue than the nature of your display. This is especially true for 720p native HDTVs, because they don’t physically have enough rows of pixels to display 1080i content natively. They must convert the signal to the native resolution of the display. Any modern HDTV with a 1920×1080 native resolution is going to be capable of 1080p and not just 1080i, which is why I treat 1080i as a non-issue. Lots of HDTV content from cable and satellite providers is offered in 1080i, but that’s a different issue. Re: HDMI cables. Don’t buy them at big box electronics stores. Period. Buy them online. I use Monoprice.com which currently sells a 3ft HDMI cable for $6.97 plus reasonable shipping costs. HDMI is a digital cable. The signal either gets there or it doesn’t. The interference issue you may be accustomed to with analog cables is essentially not applicable. Paying $50+ for a fancy HDMI cable at BestBuy does a lot for their retained earnings, but nothing for your picture quality. Also, HDMI is only one way to deliver HD content to your television. VGA, DVI, and component video will also do the trick. The beauty of HDMI is audio and video in one cable. Jeff’s right about not buying cables at big box stores. That’s how they make all their money, they practically make nothing off of TV’s and computers, it’s all on the accessories. On a related note, PCWorld has a good article on calibrating your new HDTV. It’s a great read for anyone that has never really understood calibration. One quick sticking point I’ve come across is the so called “in-store mode” retailers put their TVs in. Retailers will tweak the settings as to have the TVs supposedly look “good” next to all the others in the store. By turning up the contrast, brightness, and having the colors blown, it can trick the untrained or unawares eye into thinking the TV has a good picture. It is easy to fall for, if you don’t know what you’re looking for. I had a friend; and much like your recommendation, I recommended a Pioneer plasma since he wanted the so-called “best picture”. However after he went to the local Best Buy, I get a report back saying how the Pioneer colors were washed-out compared to this so-so LCD next to it. I take the trip to the store with him; and next to the Pioneer, I see this LCD with neon looking colors, blinding brightness, and no black level at all. So I just asked him one simple question: which TV picture looks more real to life? He bought the Pioneer. Great example. When calibrating my HDTV I had to get used to a byproduct of the retail store “nuclear mode” you speak of. When the settings were dialed in to be “accurate” some pictures looked downright boring. After much reading and experimenting I realized that there’s very few of these eye-popping neon colors in real life. I have three separate picture modes dialed in, and for sports and gaming I still let the colors pop a little, but movies are set to be accurate. I’ve also noticed that accurate flesh tones actually look a little pale. It makes sense when you stop to think about it: how many people do you notice walking around with rosy red cheeks? How many people on your TV look that way? @Jorge: 1080i is pretty much 720p, while 1080p is Full HD.